Anyone who knows me knows how much I love rainbows. I think it started when I was young and enthralled with the movie The Wizard of Oz and Dorothy singing that iconic song, Over the Rainbow. Ok, to be honest, I'm still enthralled with that movie and rainbows. *I may have a pair of red glittered shoes that my sister thrifted for me recently - my own ruby slippers. So when I saw these cupcakes, they appealed to the inner child in me...and I knew they'd be a great addition to the St. Patrick's Day party my sister and I are hosting. I dare you to be in a bad mood after looking at this cupcake. Yes, it can be a bit time consuming to individually color six mini-batches of batter. It's worth it. 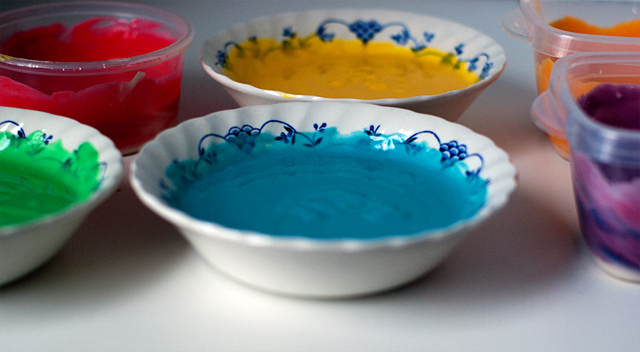 The recipe (linked to below) will tell you how much food coloring to use for each color. Placing the batter into the cups it tricky. I used an offset spatula to spread each layer of batter over the previous layer. You want to try and cover up the previous layer as much as possible. If you really want to to get even layers, you might also try piping the batter into the cups using a large tip. I must admit that for the sake of time, I did not make the batter from scratch but instead used a Betty Crocker white cake mix. What about the frosting, you say? I haven't decided yet whether to use whip cream or a marshmallow mixture to create a "cloud" of frosting. What's your vote? I don't think I've ever had marshmallow frosting but I am a sucker for whip cream frosting! These cupcakes are so much fun! You definitely need some simple white marshmallow frosting on the top. marshmallow for sure! It'll make a nice cloud shape and won't melt. Whip Cream melts in Room Temperature. GREAT photos of these cupcakes by the way; I can't WAIT to make them! I have made these for the last 2 St patty's Day with my 4 yr old,and although we start out trying to keep the colors seperate,eventually they end up looking like tie-dyed cupcakes. My peanut says,"That's OK Mom ,my friends are 3,they'll eat anything." I love it!!! Thank you so much for sharing! I can't wait to do these with my daughter! This deserves an Italian Meringue Topping - fab cake, well done! Oh and I also used Gold colored frosting to make it seem like a pot of gold at the end of the rainbow. I vote whip cream. These are really neat. Thank you for sharing. I saw it on the Betty Crocker facebook page. This fabulous cake deserves an Italian Meringue Topping! Brilliant! Whipped cream is yummy no matter what!! Those look fantastic!! Whip Cream! Marshmallow! ummmm either would be wonderful! These look amazing! i vote for marshmello frosting! Nothing, leave as is. they are soooo pretty. Love it! I don't think I'd frost them at all. They're gorgeous! Omgosh!! These are adorable.. I am going to make these with my 4 1/2 year old grandson who loves to bake with Nana.. Thanks!! Wow...sooo pretty! I love this idea. My kids will, too! I think I would go with either whip cream or a plain white frosting. That's just me, as I am not really a marshmallow person. I absolutly luv luv LOVE this idea, Thank you soooo much for sharing!!! My sisters bday is Friday, I am definitally making her a batch of these!!!! These are sooooo cute. Love them and I might just have to try them. As for the frosting my vote it Cream Cheese. Happy eating. Very cool....i would use cool whip and multi colored sprinkles for sure! These are simply too adorable!! I will definitely be making these. I love your blog♥ ! just found your blog through FoodGawker... and i think Marshmallow mixture would be a great topper to this! :) have a great day! WOW!!! Those look amazing! I will definitely have to try this out! I think you should totally do a marshmallow topping!!! YUMMY!! I made these for my daughter about 6 months ago but the turned out pastel. Pretty pastel, but I LOVE the RICHNESS of your colors. How did you get them this bright? for a rainbow, make cloud icing. that would be the only way to go. Beautiful and colorful! love this! My daycare kiddos would love these! these looks AWESOME!!! I say use Marshmallow!! This is such an awesome post! I love the colors and everything! Great idea to pipe it in. I may try that! I think the "whip cream" sounds tastier to me but will have to remain refrigerated. So in that case, I would probably suggest the marshmallow cloud! I can't wait to try this! But guess what? I'll just use white icing and pipe it on in a swirl. These are great! I am definitely going to try them, or at least a variation of them. Any tips for the type of coloring, gel or drops, and approximately how much per color? whipped cream frosing, how do you make it? Marshmallow will be sweeter than whip cream, so I would say that should determine which one. rainbow frosting. layer your icing colors in a piping bag, just like you did your cupcakes with an appropriate tip and squirt and see what happens! very cool. Those look incredible!!!! Thanks for sharing! My 4yr old just decided he wants those for his 5th birthday party instead of a cake. I don't think I can wait till July to try them out though. May have to make a trial batch. Thanks again! those look so yummy! And kiddish! Im not seeing the link to the recipe...my daughter is obsessed with rainbows also and would like to make these for her youth group..
Love this idea! I'll definitely do this with my girls for St. Patty's Day. How do you get such brillant colors without it tasting like too much food coloring? i vote marshmallow cream frosting. I'd be afraid the whipped cream would melt & make the cupcake all soggy. However, the whipped cream may be easier to work with (less sticky) & would definately taste like a cloud :o). Unless you are talking about a whip cream frosting & not actual "whipped cream". Definately something white in color tho. Ooo! or if you didn't want to cover the red you could take the top off & put the icing between, kinda like a sandwich! Just wouldn't want to Completely cover the red if it was iced on top. These look awesome! Whipped cream is my vote! Thank you for sharing. I am totally making these! How about marshmallow and if you can find them, little "gold" sprinkles or sanding sugar. These cupcakes are stunning. I think I need to make some soon! Beautiful pics. Gorgeous photos of what I'll imagine were delicious cupcakes. "Cloud of frosting." Fantastic. These are great! I am a fan of rainbows, too, for the same reason, and I vote marshmallow! These are awesome and so fun. I say pipe out little circles/drops or swirls, to look like clouds. Maybe airbrush in a little blue to the top of the frosting. I just saw your link on Betty Crocker's facebook page and had to comment here because just yesterday I made a rainbow angel food cake! It turned out great! Your cupcakes look so happy!!! Oh, I am so making these with my girls! And my vote is for whipped cream on top! These cupcakes look beautiful! Can you share the recipe, i.e. how much food coloring to use for each? these cupcakes are gorgeous! what an inventive, creative baker you are. i would use a classic seven minute frosting to make your cloud on top, but that is purely my humble opinion. linked from Betty Crocker on FB, this is one of my favorite treats for my kiddos, they love it! I make it in a bundt cake pan, start by layering the red first and then continue ROYGBIV order putting each layer in the center directly on top. When all is said and done when you cut the cake you get a perfect rainbow arch! Not sure?? Wouldn't the marshmallow icing last longer...thinking the whipped creme would melt??! These cupcakes are tooo cute! Will try them with the grand-daughters when they come next week!! Thanks! These look so vibrant and beautiful! They would be perfect to send to school for my husband's students on St. Patrick's Day. These cakes are beautiful! Who can't resist? A turkey baster might work well for more even layers of batter. And.. I would go for the marshmallow icing! Marshmellow like a could!! Or even sprinkle all colors of mini mm's or nerds etc. Sooo fun!!!! I have made these before, they turned out so very cute. For icing I mixed icing colors as well they looked like a mess which meant the kids lived it! Marshmallow! New follower here! These are adorable! These are the only cupcakes we make anymore! :o) They are time consuming but so worth every moment! We have used both a whipped frosting and marshmallow mixture and it seems the folks preferred whipped.. Have fun at your party! These look so pretty and yummy! I think I'm going to give these a try this weekend. Got to get creative for my niece's 16th bday party coming up in August. What about a rainbow chip frosting? Mmmm these look delicious! I would say cream cheese frosting. I am in Friendswood,Tx.Right by Houston. My mother was a baker professionly, I bake, and my daughter is also. I love these cupcakes. You are right they make you happy just to look at them. It is a drab,dreary,day here,and they brightened. I have four grandchildren and I bake with them. They are nine,seven,four,and two.I can't wait to let them try these. Thanx and God Bless. How about a marshmallow cream? Wish I would have thought about this earlier. 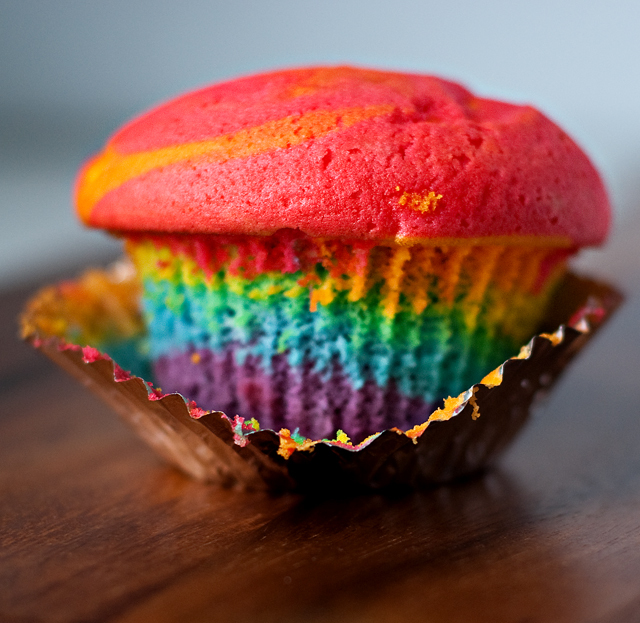 Would have made awesome cupcakes for Mardi Gras. Only do them in yellow,green and purple. Maybe next year. You can use a cream cheese icing and colour it blue as the sky or add in some marshmallow creme for thickness and lightening. WOW! Im impressed. need to try this out. Thanks for sharing. Where's the link for the amount of coloring to use? I love it! I try to find something like that for a 60's years OMG you make me happy. i get it. LOL! I made these last year (saw them on FamilyFun.com) and yes, they were horribly time consuming. 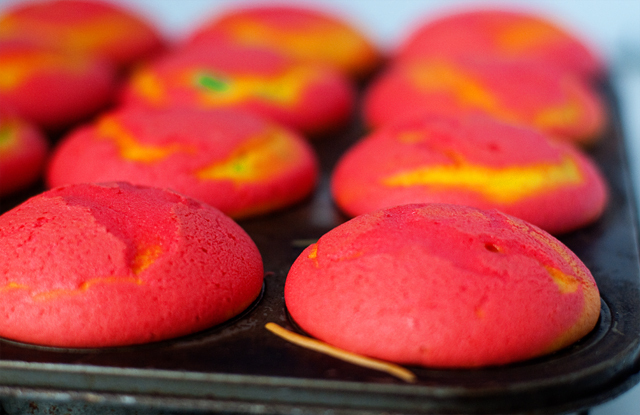 Not the dyeing of the batter, but the pouring into the individual muffin pans. I swore I'd never make these again, until about 2 weeks ago I read a tip from someone who made a version with red, white and pink for valentines day. She used small baggies, added the batter and snipped the tips to pour the batter! Trying it again next week for St. Patty's Day! LOL! I did these last year (discovered them on Familyfun.com) and yes they were quite labor intensive! 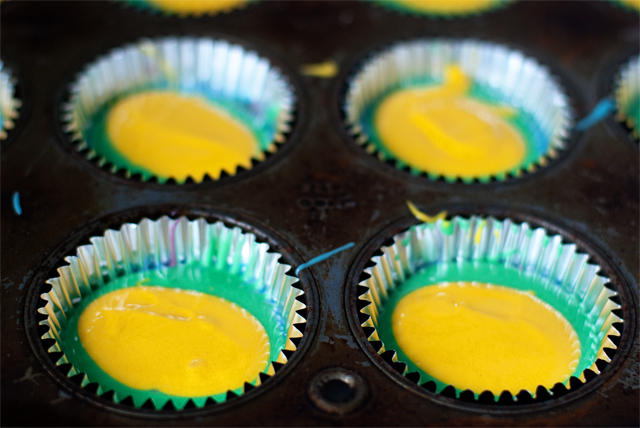 Not from dyeing the batter, but from pouring the batter into each individual muffin tin! I said I wouldn't make them again, until two weeks ago I saw a tip from a lady who made a version using red, white and pink for some v-day cupcakes. She put the batter into individual baggies, snipped the tip and then poured it in! I will be making these again, using that tip, for St. Patty's Day next week! Oh, and my vote is always Vanilla Buttercream for frosting! Talk about fun cupcakes!!!! What a super idea for kids...big or small. p.s. As for the frosting I would say the marshmallow has my vote (and the kids I am sure). pillow of marshmallow cream, with cupcake placed on edge, so rainbow is lifting off from the cloud. I absolutely LOVE this idea :) Thanks for sharing!! LOVE these cupcakes and am so pleased to have come across your blog on foodgawker. What fantastic vibrant colors. Great for a kids' birthday too. 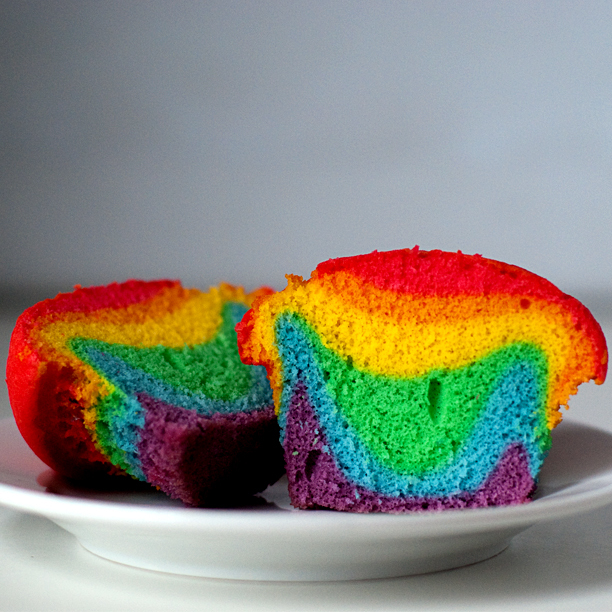 You could color the icing and put stripes or dots on the white icing to keep the rainbow effect. This is just a great idea!!! I MUST share this with my students. Hello - I used a few extra drops beyond what's called for in the recipe..seemed to work for me and didn't affect the taste. Thanks for visiting! I'm glad you're going to try them! What I was really referring to was just whipped cream on the top of each cupcake since it resembles a cloud. Not a special recipe for whipped cream frosting. Enjoy! Great idea! May try that. You're welcome! We expect to have quite a few kids @ the St. Patty's day party and I'm excited to see their reactions, too. Have fun with them! @Nieves I didn't taste food coloring at all - in fact, I was really pleased with the taste and texture of the Betty Crocker mix. I normally would make cakes from scratch, but I knew the coloring of the batter would take a while, so I decided to use a shortcut in Betty Crocker. I used a few extra drops of food coloring for each color, but that was all. @Anonymous Yes! This thought came to me later and I'm still considering it...love the element of surprise! The recipe (including how much food coloring to use) is linked at the end of the post. But here's the link to make it easy. I googled and found a great receipe. It used a white cake mix, and sour cream and milk in place of the water. I wanted it to be extra flavorful so I squeezed some fresh orange juice into the batter along with some orange zest, and threw in some rum extract. I would have used almond, but didn't have any. It was delicious!! Just google Rainbow cupcakes and you can find the recipe.